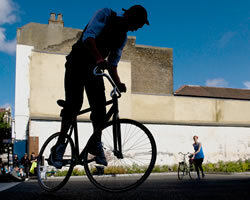 The Bunny Hop' is a dynamic, new outdoor show, fusing dance, circus and physical theatre – on bicycles! Amazing and amusing performances of around 15 mins with choreographed bike routine and comedy. Performances at 11.30am, 1pm and 2.30pm on Staurday 27th July on Putney Wharf Piazza. The Bunny Hop Ballet ©Ray Gibson approaches to cycling. Spectacular bike tricks, fast paced choreography and moments of comedy, chart the sibling’s journey, as they bicker, push, pull, giggle and wheel their way to adulthood. So in between the whizzing of the Olympic competitors through Putney catch this unsual cycling event on Putney Wharf Piazza!